In August, the crew and passengers of the Freedom Flotilla ships, Al Awda and Freedom, returned to their home countries after being hijacked, interrogated and imprisoned by Israeli commandos. The outcome may have appeared anticlimactic, since many supporters had hoped for a triumphant arrival by the flotilla ships in Gaza Harbor and a breaking of Israel’s illegal 12-year land and sea blockade of the small Palestinian enclave. But in many ways, the 2018 Freedom Flotilla mission has achieved its goals—which were to challenge the Israeli blockade of Gaza, raise public awareness of the blockade and other human rights violations, and let the people of Gaza know that they are not alone. Of course, had the flotilla ships been able to reach Gaza unhindered, it would have been a remarkable accomplishment and the first time the blockade had been breached in 10 years. Back then—in August 2008—two boats carrying international solidarity activists sailed into Gaza’s shores to a hero’s welcome from the locals, including children, who swam out to greet them. It was a dramatic display of people-to-people solidarity against the illegal Israeli blockade. Their arrival in Gaza was momentous and cathartic, and served notice to the people of Gaza that their plight—and Israel’s criminal blockade—had not gone unnoticed by the world. Israel has since shown great resolve in its determination to prevent such a display of humanity and solidarity from ever recurring again—even at the cost of innocent lives. Since then, Israel has blocked similar solidarity ships from arriving in Gaza, either by hijacking them in international waters (as took place this year) or by pressuring other governments to detain the ships, as when the Greek government compelled the Gaza-bound Audacity of Hope to return to port shortly after its departure from Athens—under threat of armed force. In 2010, heavily armed Israeli commandos boarded the Gaza-bound cruise ship Mavi Marmara, assaulting and injuring numerous passengers and killing nine of them, including a U.S. citizen. Despite the clear death threat from Israel, the Freedom Flotilla boats keep coming, including the Estelle in 2012 and the Marianne in 2015, challenging the Israeli blockade. The Freedom Flotilla phenomenon makes it evident that the movement’s momentum, persistence and staying power have little to do with its actual physical arrival in Gaza and more to do with other less tangible aspects of the journey. The actual act of challenging Israel’s illegal land and sea blockade of the Gaza Strip is in itself a bold and even revolutionary statement of the need to hold Israel accountable under international law for its human rights violations. These repeated sea-based challenges to Israeli impunity have garnered international attention and admiration from the grassroots public—particularly in view of the unwillingness of governments to acknowledge and confront Israel’s 70-year subjugation and occupation of the Palestinian people. The Freedom Flotilla’s international composition—with crew and delegates of numerous nationalities (including New Zealand, Malaysia, Australia, Canada, First Nations, Spain, Israel, United States, Norway, Sweden, etc.) has inspired and energized Palestinians in the diaspora and in their homeland. They realize that this small group of activists willing to undergo significant collective risk to highlight the Palestinians’ plight and break the silence represents the world’s people. Palestinians have responded by staging bold nonviolent actions of their own, such as the recent series of seaborne flotillas Gaza fishermen initiated to challenge the sea blockade and protest Israel’s arbitrary fishing restrictions and random acts of terrorism against fishers, who are routinely harassed and shot at while they are trying to fish, and whose fishing boats are either shot up or confiscated. Diaspora Palestinians showed up in large numbers to greet, celebrate and host the Freedom Flotilla at every port of call. The Freedom Flotilla’s engagement of local grassroots community organizations, media interviews, interaction with the public through boat tours and one-on-one conversations have raised the profile of Gaza’s plight, reminding the outside world that residents of Gaza have no freedom of movement, and that repeated, massive Israeli aerial bombings have disabled the electricity grid, destroyed the sewage treatment plant and rendered 98 percent of the water undrinkable. Meanwhile, the blockade prevents the entry of critical food, medicine and construction materials—preventing Gazans from rebuilding or repairing their destroyed homes and infrastructure. Freedom Flotilla delegates were honored at parliamentary sessions and feted by local dignitaries and government officials in several cities along their route, raising the profile of Palestinian suffering under the Israeli blockade. As a result, the Freedom Flotilla earned explicit statements of political support for their anti-blockade mission from the Spanish municipality of Asturias-Gijon and from other grassroots political organizations. 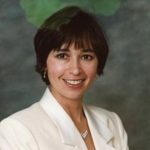 Some Freedom Flotilla participants have provided media accounts describing abusive treatment at the hands of their Israeli captors, including this piece by United Kingdom-based Al Awda delegate and orthopedic surgeon Dr. Swee Ang. This reporting has outraged the public in their respective countries and redoubled the resolve of many organizations to promote the Boycott, Divestment and Sanctions movement (BDS). Indeed, in the wake of the Freedom Flotilla action, the BDS movement has seen several notable successes. At least 15 international bands and artists have withdrawn from an Israeli music festival. Six of 11 invited speakers also have confirmed their withdrawal from a scientific forum at Ariel University, which is built on occupied Palestinian land in an Israeli settlement. Palestinian scholars had urged speakers to withdraw, citing Israeli travel restrictions on Palestinian academics. As Israeli crimes against Palestinians continue unchecked, these developments build on the international outrage. At the same time, the Freedom Flotilla’s nonviolent challenge to Israel’s blockade coincided with the (still ongoing) weekly protest by Gazans known as the Great March of Return. During this peaceful action—in which unarmed Palestinians have been asserting their rights to liberty and freedom—Israeli snipers have been shooting and killing civilians of all ages, including children, women and medical workers. Casualties now are in the thousands. Images of the victims of Israeli violence have elicited expressions of disgust and outrage toward Israel, as well as sympathy and support for Palestinian freedom. These are the atrocities that have moved members of the Freedom Flotilla to risk their own lives to make a change. 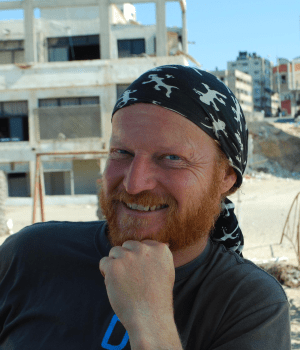 Asked why he was on his third Freedom Flotilla mission (he was aboard the Estelle and Marianne), Andreasson said: “I have blue eyes and white skin. I may as well put them to good use.” The remark alluded to an awareness that because of his race and nationality, any suffering he might be subjected to would draw international media attention—unlike the suffering of ordinary Gazans, whose daily tragedies and humiliations pass largely unnoticed by most Western news services. 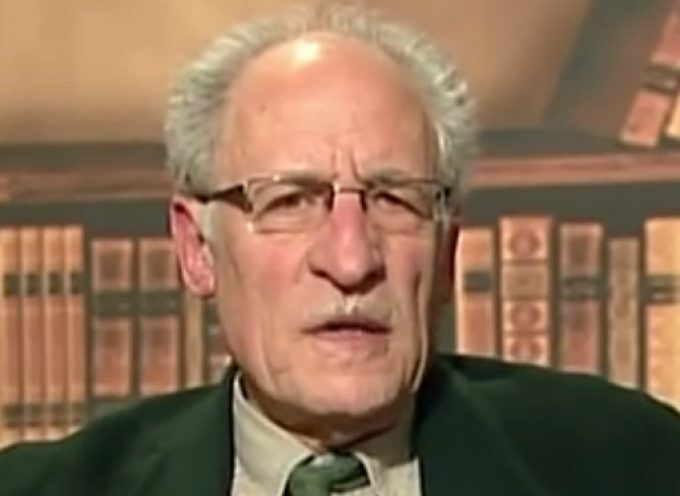 Andreasson noted that historically, change is not initiated by governments, but by ordinary people “who have had enough” and who are “standing united against injustice.” He cited as examples the U.S. civil rights movement, women’s rights, the fall of the apartheid regime in South Africa, and the rights of LGBT persons. Divina Levrini, a passenger aboard the Al Awda who also hails from Sweden and, like Andreasson, is a veteran of previous Freedom Flotilla journeys, said she has worked on behalf of the Palestinian cause since her teenage years. It was “a natural thing” for her “to go and try to put an end to the blockade” since she has been educating others about it for so many years. “If it takes Westerners to give the Palestinians a voice, so be it,” she said. Levrini thought the flotilla “made a difference.” In addition to the “very important” media publicity, the flotilla mission helped bring about political change, she said. “During the two-and-one-half months the flotilla journeyed from port to port, we actually compelled politicians to act,” she said—a reference in part to Navarre becoming the first Spanish state to adopt a BDS resolution. Before we can move toward any real justice in Gaza, more people need to acknowledge the injustice that exists. On July 29, Israeli Navy gunboats surrounded the Al Awda as it approached Gaza Harbor with 22 passengers and crew aboard (five days later, the Freedom followed with 12 aboard). Masked commandos armed with machine guns boarded the ship and violently tasered and assaulted several passengers and crew members, including the ship’s captain, Norwegian national Herman Reksten. They did this despite being repeatedly advised by Al Awda crew member Mikkel Gruener by radio that the Al Awda was in international waters and “wanted no business” with Israel. The Israelis seemed to reserve a special contempt for the mostly Norwegian crew. Not only did they physically assault them, but they tore down the Norwegian flag and trampled it underfoot, deeply offending the crew members, who managed to salvage it. Both the Al Awda and the boats were purchased, refurbished, and outfitted through the private donations of Freedom Flotilla supporters from around the world. They were to have been delivered to Gaza’s fishers as gifts of friendship and solidarity from the international seafarers. Instead, Israel has confiscated them and looted the personal effects of the passenger and crew on both flotilla ships—taking laptops computers, camera equipment, watches, credit cards, cell phones, clothing and cash. Perhaps worst of all has been the Israeli military’s failure thus far to release 114 boxes of medical supplies—including medical gauze and sutures for the Gaza health system—that had been loaded onto the Al Awda just prior to the final leg of its journey. The consignment of medical aid was to have provided needed medical supplies and equipment to a populace being bombed and shot at mercilessly, even as weekly Great March of Return demonstrations at the no-man’s land between Gaza and Israel continue. A petition is circulating to demand that the medical supplies be delivered to Gaza. The passengers and crew of the Freedom Flotilla boats are people of privilege. We can travel freely and do not have to deal with incessant Israeli repression, violence and humiliation. We know our experience cannot hold a candle to what people living in Gaza are forced to endure under Israel’s suffocating yoke of oppression. But the bold journey of the Freedom Flotilla Coalition dared Palestinians and the world to dream—to dream of a day when people of the world unite with such fervor for justice and human rights that barriers and obstacles will fall away, and peace, dignity, and freedom will be possible for all. 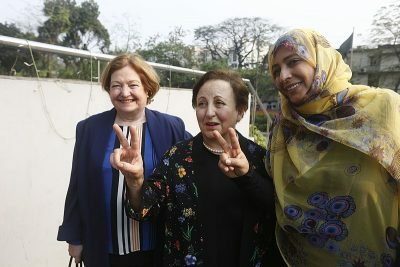 The sentiment of all those who shared in the Freedom Flotilla’s journey—passengers, crew, and the land-based support teams—perhaps can best be summed up by the words of Irish Nobel Peace Prize recipient Mairead Maguire, a veteran of many Gaza solidarity boat journeys (one of the 2018 Freedom Flotilla ships was named after her) who understands the challenge ahead. Reports are coming in that Israel plans to sell off the four mercy boats it violently hijacked on the high seas a few weeks ago. The peaceful, unarmed vessels were sailing with desperately needed medical supplies to the besieged Gaza Strip which has been illegally blockade by Israel for 12 years. The crews and passengers of these mercy boats were arrested by the Israeli military, beaten up, thrown in jail and had their money and personal belongings stolen while in custody. Among the passengers on the al-Awda, was British citizen Dr Swee Ang, a consultant at the famous Bart’s Hospital, who susteained two cracked ribs. The boats were intended as a gift to the people of Gaza, probably the fishermen, but Israeli intelligence officials claimed they would end up in the hands of Hamas. So the Israeli Central Court has decided sell the boats – stolen property – and hand the proceeds to Israeli families illegally squatting on Palestinian land. Nearly three years later, as Gaza Freedom Flotilla II prepared to sail, the Zionist conspiracy was determined not to let the boats reach their destination because safe arrival would drive a coach and horses through Israel’s control-freakery. Earlier that year the Mavi Marmara had been assaulted with lethal force in international waters, without a care for how many they killed. One of the organizers in London told me that when the British boat’s final passenger list was confirmed, the Foreign Office in London would be contacted with details and asked to “act to ensure the safe passage of their citizens”. In the end Flotilla II didn’t sail. Israel is clearly acting illegally by interfering with the peaceful voyages. A UN fact-finding mission, investigating the assault on the Mavi Marmara, declared that “no case can be made for the legality of the interception and the Mission therefore finds that the interception was illegal…. and to constitute collective punishment of the people living in the Gaza Strip and thus to be illegal and contrary to Article 33 of the Fourth Geneva Convention”. It could not even be justified even under Article 51 of the Charter of the United Nations [the right of self-defence]. At the same time Security Council resolution 1860 (2009) emphasized “the need to ensure sustained and regular flow of goods and people through the Gaza crossings” and called for “the unimpeded provision and distribution throughout Gaza of humanitarian assistance, including of food, fuel and medical treatment”. One year after the military action by Israel against a convoy carrying humanitarian aid supplies to Gaza, during which at least ten civilians were killed, another humanitarian aid flotilla to Gaza is now being organised, the principal cargo being supplies of stationery for school pupils. Is the EU and in particular the Commission aware of the new mission that is being organised and what is its position on this matter? Given the participation of EU Member State nationals and the presence of MEPs, will the EU take any measures to ensure that the personal safety of its nationals is not endangered? 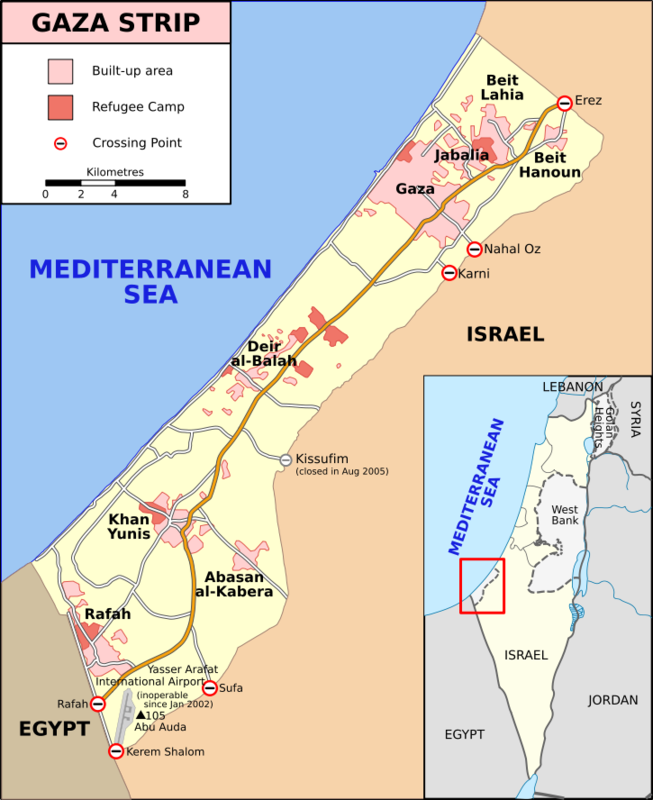 After the organisation of a flotilla heading to Gaza in May 2010, the Quartet, of which the EU is a member, stated that all those wishing to deliver goods to Gaza should do so through established channels, so that their cargo can be inspected and transferred via land crossings into Gaza. It also stated that there was no need for unnecessary confrontations and that all parties should act responsibly in meeting the needs of the people of Gaza…. The Commission stands by this line. A flotilla is not the appropriate response to the humanitarian situation in Gaza. At the same time, Israel must abide by international law when dealing with a possible flotilla. The EU continues to request the lifting of the blockade on Gaza, including the naval blockade. EU Member States have the responsibility to protect their citizens abroad via their consular services. This responsibility covers assistance for their citizens who might participate in a possible flotilla…. It could have been scripted in Tel Aviv and not by anyone with Christian principles. The “established channel” for delivering goods to Gaza is of course the time-honoured route by sea, which is protected by maritime and international law and therefore entirely appropriate. There’s nothing “provocative” about unarmed vessels with humanitarian cargoes using it. The organizers had offered their cargoes for inspection and verification by a trusted third party to allay Israel’s fears about weapon supplies. They should not have to dirty their hands dealing with a belligerent regime that’s cruelly waging a starvation war on women and children. Anyone suggesting they must do so seeks to legitimize the blockade, which we all know to be illegal and a crime against humanity. And where is the UN when their maritime Convention is trashed? Fast-forward to 2018. Her Majesty’s Government has now abandoned all pretense of upholding the Law of the Seas or even pursuing its 2008 policy of intervening to obtain advance clearance from the Israeli authorities. The Foreign Office appears to have joined the Zionist conspiracy to legitimise the Gaza blockade and support Israel’s control-freakery. The waters off Gaza are international waters where neutral civilian vessels are entitled to free passage under the UN Conventional on the Law of the Seas. Why shouldn’t unarmed aid boats be able sail there unmolested? Is the Law of the Seas now dead? Is Britain no longer committed to keeping the sea lanes open to innocent shipping? And why is the UN not upholdings its own Convention? In particular, what happened to the diplomacy of 2008? If our embassy was discussing the aid flotilla with Israel nearly 2 months before the 2018 hijacking, what were they talking about? Why didn’t they arrange advance clearance as before? Or were they, by any chance, colluding to thwart this mercy mission? Wouldn’t put it past them. Mosat was a senior political adviser to the Israeli ambassador. The ambassador is Mark Regev, Israel’s former propaganda chief and a notorious liar. Burt goes on to say that he recently visited Gaza and the UK Government has announced a new £38 million pogramme for economic development in Gaza and the West Bank and £38.5 million for UNRWA to help refugees plus £2 million for clean water and sanitation in Gaza. I had made a point of saying I did not wish to receive the usual pro-forma Foreign Office response, but that is what I got. “Expects Israel to show restraint and fully respect international law”? When did that ever happen? “Expects those responsible to be held to account”? But who’s to do it when Israel is such a “close friend”? We’ll tweak the whiskers of the Russian Bear and slap sanctions on Iran for no good reason. But we fall over backwards to reward Israel for its never-ending evil. Isn’t it time Government ministers stopped embarrassing us, and themselves, by telling everyone that “we” are “close friends” with a racist endeavour run by a thuggish regime that is contemptuous of international law and the norms of decent behaviour? There’s a name for people who admire that sort of thing. And by throwing even more British taxpayers’ money at the situation instead of taking punitive action (such as suspending the EU-Israel Association Agreement) we simply legitimize the blockade on Gaza and normalise the decades-long occupation of the West Bank and East Jerusalem. But that’s the whole idea, is it not Mr Burt? Or is Britain really so weak and so lacking in leverage that we cannot do a small favour for the beleaguered women and children of Gaza whose constant misery is largely due to our arrogance and stupidity? Israel is fighting constantly not only against Gazans, and against Palestinians generally; it is fighting constantly against freedom-loving people everywhere, who oppose dictatorship of any type, and in any country, on principle, irrespective of nationality. Anna Dressler was a ship-hand on a flotilla of two small boats launched from Palermo Italy that were manned by 34 people from 12 countries in international waters and that were seized — stolen — by Israel’s military, on 29 July 2018. They became seized because these boats were carrying medical supplies in violation of Israel’s internationally illegal blockade against food and medicine reaching the residents of Gaza. She was on the boat “Al-Awda,” which was 42 miles from Gaza at the time of seizure-theft. Israel’s troops seizing it were masked, and were armed with machine-guns. The first video of this incident was released on August 20th. The two boats ‘Al Awda’ (The Return) and ‘Freedom’ were hijacked by the Israeli Occupation Forces in international waters 42 and 49 nautical miles respectively off the coast of Gaza. During their unlawful detention, crew, participants and journalists were subjected to a range of physical and emotional violence. The captain of Al Awda was threatened with execution, 4 people were tasered, 3 people had ribs broken by the Israeli military and one person had his foot broken. They were all taken against their will to Israel, unlawfully imprisoned and ultimately deported. The Israeli authorities have stolen the boats and the 13,000 Euros worth of medical supplies that we were carrying as gifts, as well as many of the participants’ personal belongings (including clothes, a Bible, credit cards, IDs and mobile phones). Incredibly, they have begun to take legal action to attempt to confiscate the boats. These people had been in constant communication with their colleagues on land; so, if they’d been killed by the Israelis, it would immediately have become an international incident, enraging 12 countries. They had to be released, and thus they were. These people weren’t Palestinians; they had rights that were cared-about in other countries. Though a gangster-state, Israel recognized that these people couldn’t be simply discarded, like trash — as Palestinians are treated by Israel. Anna was born in Germany and is now living in Sweden, but mostly she is out on travels and ‘projects’ around the globe. She is an activist and problem solver – a person with a diversity of professions. In 2012, she was the Project Leader for an anti-money laundering campaign. In 2015-2016, she participated in a private project working with refugees near the Macedonian border and along the Balkan route. She enjoys her freedom wholeheartedly and wants others to have the same opportunity. As always, our boats carry representatives from across the world and messages of love and solidarity for those living under the inhumane, decade-old blockade – the collective punishment on the civilian Palestinian population of Gaza. Given the dire situation in Palestinian hospitals, we are also transporting some urgently needed medical supplies (#Gauze4Gaza). It is also encouraging to see the local welcomes we are being given, including by the Mayor of Palermo who rightly connects our campaign with the Caravana Abriendo Fronteras, who have just arrived from Spain, and similar demands for the opening of borders and freedom of movement from the City Council of Cádiz (Spain) and Naples (Italy). 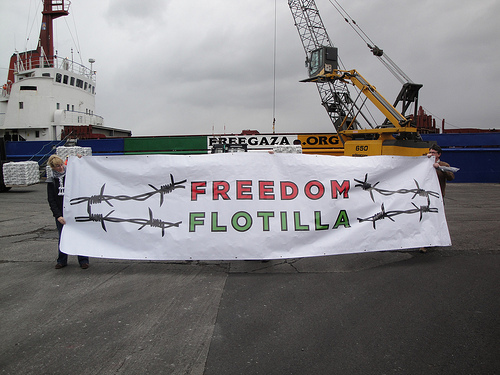 Freedom Flotilla leaves Palermo to break the illegal Israeli blockade of Gaza. Three boats are sailing with boxes of medical supplies: Al Awda (The Return), a large converted fishing vessel; Freedom to Gaza, a large sailing vessel; and Falestine, a smaller sailing vessel. A fourth boat, Mairead, will not sail at this time. Another Sicilian port Messina, opened its open arms as usual with a series of wonderful community events, and we are grateful for their solidarity. All three boats making their way to Gaza will be donated to the Union of Agricultural Work Committees, that includes a fisherman’s union that will use the boats to fish in order to feed their families. Spokesperson for the Swedish Ship to Gaza campaign, Jeannette Escanilla, said the boats would provide important economic and training opportunities for Palestinians trapped in Gaza. Gaza is a zone in the world where human rights seem to be forgotten. I believe that every person can change the world, on their own way, wherever they are and in which way they can. Let’s start here, with a blockade that should never have existed, and continues, along with everyone else, man-made, disasters. On August 4th was posted to youtube “ANNA DRESSLER – SOS”, in which, six days after the seizure, theft, and assault, by Israel, against these people and their vessels, Anna, speaking in Swedish, publicly demanded that her Government in Stockholm enforce her rights as a Swede, against the Government of Israel, and that the ships and their supplies be at least returned to their owners. On that same date, August 4th, the Freedom Flotilla itself headlined “SOS – Just Future for Palestine”, and officially notified the foreign ministers of the 12 involved countries whose nationals’ rights had been violated by Israel in this incident. These 12 countries were: Australia, Canada, Denmark, France, Malaysia, New Zealand, Norway, Singapore, Spain, Sweden, UK, and U.S.
Ship to Gaza’s sailing ketch “Freedom for Gaza” was approaching the coast of Gaza when it was boarded by Israeli militants on Friday 3 August on international waters, a gross violation of international law. The last reported position of the vessel before boarding was about 40 nautical miles from coast of Gaza at 20:06 (CET). The Swedish flagged ship and its cargo of medical supplies were seized by Israel and the 12 persons onboard were abducted and led to Israel, a country they did not intend to visit. Ship to Gaza demands that the captured crew, the ship and its and cargo will be returned to the position where they were boarded and allowed to continue their voyage on international and Palestinian waters without being interupted, in accordance with international law. In this way we can complete the purpose of the journey, which is to hand over “Freedom” as a gift to Union of Agricultural Work Committees (UAWC)*, as well as 18 boxes of medical supplies, gauzes and sutures, to the organization My Care in Gaza. The lack of healthcare in the Gaza strip is appalling. Our long term demands are also that the eleven-year illegal and destructive blockade of the Gaza Strip is finally lifted. The Swedish government has repeatedly backed the requirement of a lifting of the blockade. We now expect that the same government, whose flag is worn by the attacked ship, will also support our specific requirements regarding crew, cargo and ships. Ship to Gaza calls on Israel and Egypt to now meet the demands of large parts of the world community, that the illegitimate and destructive blockade of the Gaza Strip will be lifted after eleven years of isolation and aggression. Ship to Gaza has now received an answer to the open letter that we, through our chairman Jeanette Escanilla, have sent to the Swedish Minister for Foreign Affairs, Margot Wallström on August 5th. Thank you for your letter dated 5th of August 2018. The situation in Gaza is very critical. UN Secretary General Antonio Guterres has described the situation as a humanitarian crisis. Furthermore, as you wrote, the lack of medical supplies is disastrous, not least since so many people have been injured as Israeli military has been deployed in connection with demonstrations along Gaza’s border in recent months. Sweden upholds the principle of freedom of the seas and freedom of navigation. The government has been in contact with the Israeli authorities regarding Ship to Gaza, and has expressed that the actions of the Israeli authorities in relation to the Swedish-flagged vessel Freedom and the persons onboard constitutes a breach of international law. The government has also demanded that the ship, its cargo and the persons who were aboard be released. The Swedish Embassy in Tel Aviv is monitoring the imprisoned Swedish citizens’ consular rights and visited all of them on Sunday, August the 5th. The Swedish government will continue to work towards an end to the Israeli-Palestinian conflict and towards a fair and sustainable two-state solution in which the two states can co-exist, peacefully, side by side. Ending the isolation of Gaza and providing humanitarian aid to its people are two critical, urgent steps towards that end. Ship to Gaza wishes to emphasize that the wording … in principle corresponds with our own demands that the crew, cargo and boat should be returned to the place where they were boarded and be allowed to continue their journey to Gaza. We are now being notified that the activists and crew is being deported from Israel. This is not in agreement with our demands or with the requests of the Swedish government. We also want to know what the Swedish government is doing now to enforce the demands regarding our ships, cargo and crew, but even more importantly, also with regards to the blockade of the Gaza Strip. Anna’s resolve is strengthened and she declared that “We will continue to fight for freedom…”. Please continue to demand the release of all of the Political Prisoners. On August 13th, the Freedom Flotilla posted “SECOND MEDIA RELEASE ON MEDICAL SUPPLIES NOT REACHING GAZA” and listed, and linked, to the international laws that Israel had violated in this incident. While the mainstream, including the BBC, have been sticking the knife into Corbyn, none of them (as far as I’m aware) reported a much more serious outrage – the hijacking by Israeli Occupation Forces of two vessels heading for Gaza and the violent assault, abduction and imprisonment of the 34 people from 12 countries who were on board – one of them a British consultant from the famous ‘Barts’ Hospital in London. That is basically where things currently stand on this matter. The other governments involved (among the 12, besides Sweden), have been silent. Only Dressler’s nation has not. But no indication exists that even Sweden is following up with any demand against Israel. The underlying assumption seems to be that governments in The West (including the Sauds and their friends — all also “Western”) will continue simply to side with Israel against the Palestinians, even when their own citizens’ rights have been violated by Israel’s illegal imposition and enforcement of this illegal blockade. Among the Governments that refused to enforce its citizens’ rights in this matter is the United States. Refusing to enforce its citizens rights that have been illegally violated by Israel, is routine for the U.S. Government to do. Ever since 1967, Israel has been supported by America, though America’s enemy, at war against Americans, and Israel has stayed that way, but the U.S. Government itself (and its news-media) has been keeping that fact, of Israel’s war against Americans — Israel’s being an enemy — a bipartisan secret from the American people (who are required, furthermore, by their Government, to pay to Israel’s Government, $3.8 billion per year, so that it can buy U.S.-made weapons from Lockheed Martin and other politically top-connected American companies — Eisenhower’s “military-industrial complex” — which are the intended beneficiaries of this coercion, by America’s Government, against America’s citizens). It’s the proven and incontrovertible reality, of the U.S. Government’s tyranny, against its own people. Without such lies as that Israel is America’s friend instead of America’s enemy, and without such hiding of crucial facts from the public (for ‘national-security’ purposes, of course — not for billionaires’ profits), none of this could happen, and could be even credibly called ‘democracy’. This is actually a ‘democracy’ based on lies. But is that really possible, or is it instead just another lie, one to cover-up all the others? If that’s the case, then the problem is, obviously, much deeper than merely Israel versus the Palestinians, and nothing that the mainstream press publishes in The West regarding international relations can be trusted, at all, for its keeping this secret throughout the decades. Certainly, what you are now reading, on this site, isn’t mainstream in The West. So, you are here reading Western samizdat, forbidden truths — truths that are forbidden to be published in The West. Nonetheless, all of this article is documented to be true. Just click onto a link anywhere that you doubt it. You will find that it’s all true — not just “maybe true” (like mainstream ‘news’ often is) — it is all unequivocally true. And, yet, what politician can say it? What would they be implying if they did say it? Can they say it? Apparently not. What you’ve read here is, therefore, exposing just the visible tip, of an iceberg, of lies. The Palestinian resistance bombed Tuesday morning the settlements of the so-called “Gaza envelope” with dozens of rocket-propelled grenades in response to Israeli crimes against Palestinians. The Israeli military confirmed that a barrage of more than 28 mortar shells was fired toward the southern occupied territories. Israeli media said the IOF attacked eastern Gaza with artillery fire. “Rocket sirens were heard around 7 A.M. in several southern Israeli communities, including Eshkol, Shaar Hanegev and Sdot Negev. Residents in the vicinity reported sounds of explosions. About an hour later, a second round of rocket sirens was heard again in Eshkol. A third round of sirens was heard around 9:30 A.M. in the kibbutzim of Nirim and Ein Hashlosha,” Haaretz reported. Israeli fire has killed more than 110 unarmed Palestinians, during protests against the Israeli aggression, which climaxed on May 14. 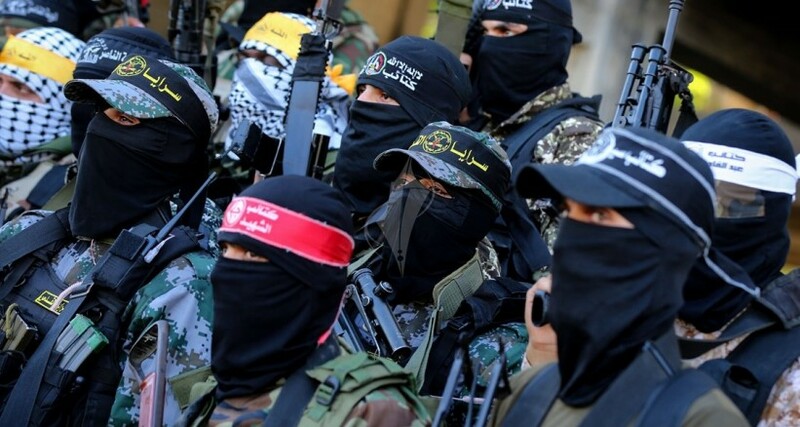 On Sunday, Islamic Jihad resistance movement threatened to respond to an IOF attack on Hamas targets in southern Gaza in which three of its fighters were martyred. “The Zionist enemy cannot dictate a new formula in which it will harm our people without a painful response,” the Al-Quds Brigades, Islamic Jihad’s military wing, threatened. 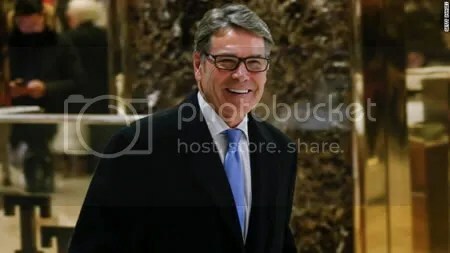 Former Texas Governor Rick Perry apparently is President-elect Donald Trump’s choice to head the Department of Energy–or at least that’s what the New York Times and others are reporting. The media are making much to do of an on-air gaffe by Perry in 2011 when he was running for the Republican nomination for president (a race he ended up losing to Mitt Romney). At that time, in a televised debate, Perry attempted to name three federal departments he intended to close should he be elected president. The three departments were the departments of Education, Commerce, and Energy (although, ironically, he drew a blank when trying to think of the name of the latter–the very department he apparently will oversee in the Trump administration). Below is an article I wrote on Perry back during that 2011-2012 campaign season. The article does not deal with his on-air gaffe but rather with a prayer rally he held at Reliant Stadium in Houston in August of 2011. Perry professes himself a Christian, but as I noted in the article, during the prayer rally Jesus was scarcely mentioned at all while God was presented as a deity who overall has no great qualms with America’s wars. You’ll keep in mind, of course, that at the time I wrote the article, the war in Syria was just getting under way. ISIS had yet to emerge, and widespread killings of Christians had not as yet begun to happen. You might also keep in mind that the policies of Israel and the US have helped to fuel ISIS. Rick Perry, the exhibitionistic governor of Texas, claims he’s a Christian. On August 6, 2011, in a sports stadium in Houston, Perry held a “prayer and fast rally” which drew some 30,000 people, a day-long affair that had been organized with the aim of praying for a “nation in crisis.” Certainly the U.S. is in a crisis, and as a person of religious faith I obviously think prayer can be a spiritually awakening experience when undertaken from an attitude of genuine and steadfast sincerity and with humility and love for God foremost in one’s mind. But here’s the thing: like all of America’s politicians, Perry is little more than a painted caricature of a human being to whom sincerity seems to be a hazardous chemical compound best discarded and left alone. Our hearts do break for those who suffer, those afflicted by the loss of loved ones, the pain of addiction, the strife that they may find at home, those who have lost jobs, who have lost their homes, people who have lost hope. In other words, God and politics don’t mix. But such a claim is by its very nature political. If you stand before a crowd and proclaim God’s political neutrality on the multiple wars America is waging in Iraq, Libya, Afghanistan, and elsewhere, you have made an inherently political statement. You are saying that God only cares about the individual’s salvation, not mass killings. This in essence is a validation of the status quo, an affirmation of war—the same wars that have bankrupted the country to the point of causing suffering and job loss to the very Americans Perry claims to be praying for. The governor, despite assertions to the contrary, is injecting politics into the religious debate and religion into the political debate. And what of Jesus? If God is to be depoliticized, what becomes of Christ and of such overtly political statements as “It is easier for a camel to get through the eye of a needle than for a rich man to enter heaven”? There doesn’t seem to be much room for them, does there? Is it not odd, that while the Texas governor inserted biblical quotations into his speech—three in all, two from the Old Testament and one from the New Testament book of Ephesians—at no point in his twelve and a half minute oration did he supply a single direct quote from Jesus? Fancy that if you will! No quote from Christ—and at a Christian rally no less! Were Perry a true follower of Jesus, he might well have quoted Christ’s beatitude, “Blessed are the peacemakers,” and issued a call for the wars to end; or perhaps he might have recited the parable of the Good Samaritan as an illustration of why programs to help the needy—programs almost totally gutted in recent years—now, more than ever, need urgently to be restored; or he could have reminded his listeners of Jesus’ uncompromising denunciation of the political leaders of his day—“Woe to you teachers of the law and Pharisees, you hypocrites!”—and called upon all Christians to follow that preeminent example of standing up and speaking truth to power. In Christian Zionism, Christ is reduced to a minor, almost inconsequential figure. CZs [Christian Zionists] are quick to point out that Jesus was Jewish, and that’s certainly a point in his favor where they are concerned, but the vast majority of his teachings are discarded. For CZs, the real object of worship is the Jewish people in a collective sense. Let me repeat that: CZs do not worship Christ; they worship Jews. Extremely steeped in the Old Testament, the theology of Christian Zionism is driven by the belief that Jews are God’s “chosen people”, that they are therefore superior, and that it is the obligation of Gentiles to “bless” them (read: “serve” them) as is commanded in Genesis 12:3. Any concerns about Jesus come secondary to this. CZs view the establishment of the state of Israel in 1948 as nothing short of a miracle of God, and this is a belief they are likely to retain no matter how many mass murders, genocides, war crimes, and crimes against humanity Israel commits. In fact, the more Israel does these things, the more CZs are likely to approve of it, for the Jews of the Old Testament carried out very similar acts. Father our heart breaks for America. We see discord at home; we see fear in the market place. We see anger in the halls of govt. As a nation, we have forgotten who made us, who protects us, who blesses us, and for that we cry out for your forgiveness. We pray for our nation’s leaders, Lord, for parents, for pastors, for the generals, for governors, that you would inspire them. In these difficult times, Father we pray for our president, that you would impart your wisdom upon him, that you would guard his family. We pray for our military and the families who love them, O Father especially for those special operators who lost their lives yesterday [chokes back a sob] in defending our freedoms. You call us to repent Lord, and this day is our response. We give it all to you, for thine is the kingdom and the power and the glory forever. Amen and amen and amen. On the other hand, we should not forget that it was also the gist of the Baraita’s [non-Mishnaic oral laws’] narrative that the Jews took upon themselves the responsibility for Jesus’ execution. So the later Babylonian discourse may not want to accept the Gospel’s blame for Jesus’ death; rather, like the Baraita but with different reasoning, it may want to convey the message: yes, the Roman governor wanted to set him free, but we did not give in. He was a blasphemer and an idolater, and although the Romans could probably not care less, we insisted that he got what he deserved. We even convinced the Roman governor (or more precisely: forced him to accept) that this heretic and imposter needed to be executed—and we are proud of it. Could Pink Floyd be planning a reunion concert in support of Palestine? Well, band member Roger Waters took to Facebook yesterday, posting a message that suggests that it’s definitely a possibility. David Gilmour, Nick Mason and Roger Waters stand united in support of the Women of the Gaza Freedom Flotilla, and deplore their illegal arrest and detention in international waters by the Israeli Defense Force. Waters’ post references the recent detention of female activists aboard a boat that attempted to break the Israeli blockade of Gaza, in an effort to deliver aid to the besieged Palestinian area. This isn’t the first time that Waters has expressed his support for Palestine. The rock star has long been vocally opposed to Israeli aggression and has consistently expressed his solidarity with the Palestinian people. “After visiting Israel in 2005 and the West Bank the following year, I was deeply moved and concerned by what I saw, and determined to add my voice to those searching for an equitable and lawful solution to the problem,” Waters wrote in an op-ed for Salon in 2014. Earlier this week, Waters also posted a video expressing support for the flotilla heading to Gaza. In the video, Waters also expressed his support for the fans of the Scottish football team, Celtic, that waived Palestinian flags during a match between the team and an Israeli football club. The Celtic club was fined by the UEFA over the protest, but in response, fans raised more than 130,000 British pounds ($161,748) for Palestinian charities.